Yesterday we had what will probably be a minor prelude to a major snowstorm. It sounds as if we may see upwards of 24″ between Monday night and Tuesday morning with strong winds. I’ll fire up the generator tomorrow to be sure we’re covered. This morning I visited Dean Brook to see how the fresh snow and ice looked. Shooting snow in the woods is often less than rewarding as the debris that falls out of the trees makes an awful mess, but today was nice and fresh. Pure as the driven snow, as they say. Much of the brook was flowing under thick ice shelves and for a few compositions it would have been nice to venture out onto them. But a fall through the ice as a child and possibly the wisdom that come with advancing years convinced me to stay close to the edge where I knew some large rocks were solidifying the shelves and making conditions just a bit safer. Guess that I am getting a little wussy in my old age. 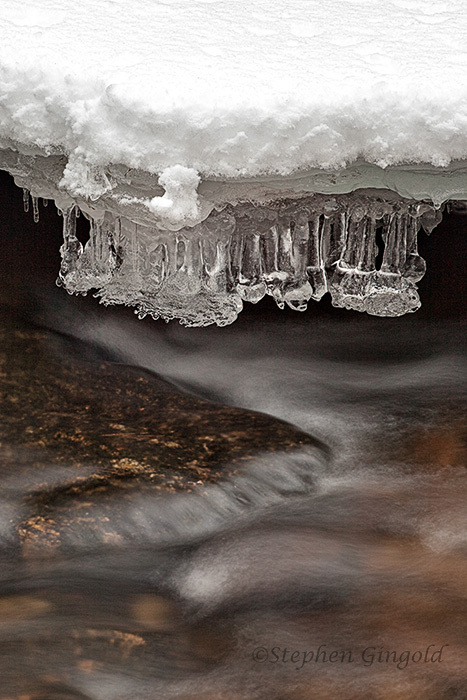 So here is one shot of a small bit of the flow in front of some nice icicles and some of the “pure driven snow”. It was just around 32°F this morning, but tomorrow will be @4°. I have to have a bit of blood drawn at 7, but will go looking for some more of this stuff after that. This entry was posted in Ice, Intimate Landscape, Nature Photography, Patterns in Nature, Water, Western Massachusetts and tagged cascade, Dean Brook, ice, icicles, intimate landscape, Massachusetts, New England, shaped icicles, Shutesbury, water, western massachusetts, winter ice and snow. Bookmark the permalink. I’ll vote for smart over wussy every time. Having taken a plunge into 45F waters many Januarys ago, I don’t recommend it, and I don’t care what they call me for avoiding it in the future. I really like the “frosting” of snow atop the ice. The difference in textures is pretty. It’s hard to know what you’ll have to photograph once this is all over, of course. I fear our opportunity for snow is gone for the year, so I’ll just have to enjoy yours. I’m glad to see you mention a generator, but I do hope you don’t lose power. Here’s a link to a really good NE weather blog that many of my friends follow. PCroton’s not given to hysteria, and he knows weather. He’s located up your way, and there’s usually a lot of live-blogging during these events, which can be fun and informative to follow. Here’s to not-as-much-as-predicted. Thanks for the link, Linda. Weather Underground is one of a couple sources I look at. This time they are all in agreement. Nice photo. I agree it is better to be safe and dry than sorry and wet. My sources say you are going to get a significant snow storm. My brother is on the mid-coast of Maine. He said the total was just upped to 24″ with 60 mph winds. He is hoping to not lose power. He will bring in more firewood tomorrow. I am not jealous of your next few days. Stay safe and warm. I have seen the prediction maps for Maine and I think they will get hit a little harder than we shall. But it is looking grim. I don’t mind the accumulation but the drifting is no fun and power outages are terrible. We have plenty of candles and flashlights. I usually clear the snow a few times when we get this much. Wussy = showing some commonsense. That way we get to see the next instalment. I think common sense is something that grows on you, Andrew. You and me both, brother. It’s an intermittent quantity right now. Those are some nicicles you’ve got there. Best wishes for many more, as well as for not having to use your generator. Now if you could manage to get an appealing picture of slush, that would be a photographic feat. I think you mean that soft mushy stuff that is between snow and ice. The above was actually water freezing as it flowed, but it’s a close call. Yeah, that stuff in the link is slush, but I think of slush more as a clear crunchy slurry that also can be found with various food colorings and the word “Puppy” added after. The slush that I grew up with in New York was what resulted after a snowfall, as the pollution in the air and the splatter from passing cars gradually turned the slowly melting white into grungy shades of gray. I’m guessing that’s the kind of slush Tallulah Bankhead had in mind when she made her sarcastic comment. And I think there’s also the implicit suggestion that you could replace the final sh sound in slush with a different one…. I have been thinking about a pair, David. I have hip boots now, but chest waders would be even better. My concern with going through the ice over a strongly rushing stream has more to do with getting sucked under although freezing into a block of ice as I walk back to my car would be no fun either. I actually don’t mind the taking of blood. Needles have never bothered me and I have a nice big bulge in my vein that takes all the digging around out of the equation. Every phlebotomist’s eyes light up when seeing that welcoming target. The coast is due to get hit harder than we will inland. So if we get 12-24 they will see 18-36 possibly. I just stocked up on batteries for our flashlights and lantern. We have candles in jars for steady dim light. And as you probably know, wood stoves don’t require electricity (which is why we ditched our pellet stove) except for those with fans. So we have heat as well as the top of the stove for cooking if necessary. The big improvement is the generator which we did not have back in October of 2011 when we lost about $1000 worth of food in the freezer and fridge. Hopefully we won’t need it. I hope your sister and mom don’t have to deal with any power loss or other related hardship. I was worrying about the snow pack and the potential for a meager spring melt. Worries gone now. Stay warm the next few days. I’m glad you’re so well prepared. Yesterday wasn’t so bad for cold, Melissa. Right around 32° It was in the teens this morning and the real event is just now starting. So far I have heard…Snowzilla…Snowpalooza..and Snowmageddon. Amounts like this happen occasionally, Melissa. I just posted this on FB….”I was just remembering the day we moved Mary Beth here from Philly in 1983.. We were going to spend the night there and drive back the next morning. My dad called to tell us that there was a storm in Pittsburgh headed toward New England so we packed everything up quick like and drove until 2 am, beat the snow there, parked the truck and went in to sleep. The next morning we had to unload after clearing 18″ first.” We’ve had a yearly total around 100″ a few times, but that was made up of lots of smaller amounts over the months. Quite often our storms swirl and come from the northeast and are called Nor’easters. A new name dropped in…Northbeaster. As a kid I lived in Syracuse and we had storms like this coming off Lake Erie on a regular basis. After we moved to New England they still happened during the fifties, as far as I remember. Not as often now.